Name - string (required) - This will be the name of the field. Attributes - array - This will be the HTML attributes applied to the field. Settings - array - This will be custom settings that can vary between fields. Label - boolean - This is not the label text. Set false to disable the label. Assuming Form is set to a variable called $form, here is how to use the fields. The password field will never return its value. This field should always go at the top or bottom of a form to prevent formating issues. The editor field uses Redactor 10. Radio buttons can have a default value. To set the default to "Male" specify the value 'm'. Checkboxes can have a default value. Setting the default setting to true will make the checkbox checked. You can also set the select field to multiple values using the multiple method. Select dropdowns can have a default value. To set the default to "Male" specify the value 'm'. Use the wpEditor() at your own risk. This editor was never designed to work in a metabox, repeater or matrix. Also, you should only have one WordPress editor per page. You can also set the WordPress editor internal settings. For example, turning off the media buttons. Color fields can have a palette defined for the color picker. Five or six is best. Images are saved by their attachment ID. Files are saved by their attachment ID. Galleries are groups of images saved by their attachment IDs. You can search all post types - drafts will be included. Also, you can search a specific post type. You can search a taxonomies terms. The repeater could be a group of fields for a conference speakers name, photo and a link to their slides. Take a look at adding a meta box with the repeater. There are three methods for dealing with fields. These methods are: getFields(), setFields() and appendField(). Matrix and builder fields work a lot like repeater fields. However, they are not limited to the same field groups like repeaters. The matrix field lets you create modular sections. The Builder lets you create modular designs in an easy to use way. The main difference between the two fields is their front end design. A builder uses a slide deck style for creating field groups while the matrix field uses a simple select dropdown. As an example, the Page Builder Plugin uses the builder field. These fields use what are called "Components". Components are the field groups dynamically generated when a new item is added to the matrix or builder field list. To start added components there are three directories you need to work with. The directories are: resources/visuals, resources/components, and wordpress/assets/components. The resources/visuals directory is for adding the HTML for each components front-end design. The resources/components directory is for adding the backend fields for each component. Finally, the wordpress/assets/components directory is for the thumbnails of the components. Note: Matrix fields do not require thumbnails. To make components create a folder in each of the folder location with the name of the field created. For example, a field named "Page Builder" would have this folder structure. Once the files are created you can begin adding code to the front end and backend files. For example, the "Content" component. For the backend file, resources/components/page_builder/content.php. 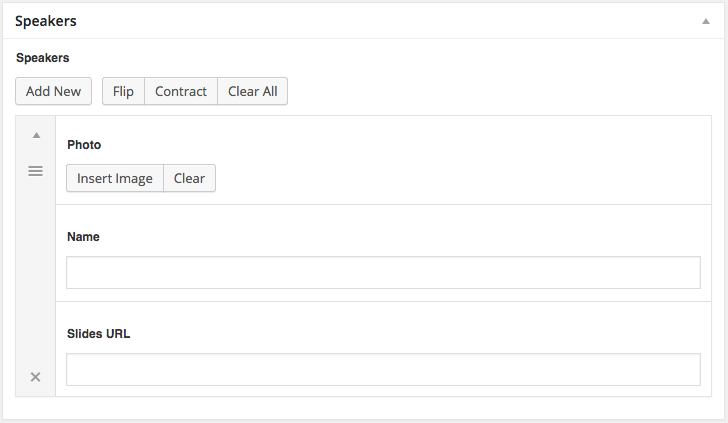 The $form variable will be created for you and the <h1> tag with be the component's label on the backend. For the front-end file, resources/visuals/page_builder/banner.php. The $data variable will be created for you can contain all the fields information for you.